This post was originally published on January 4, 2018. 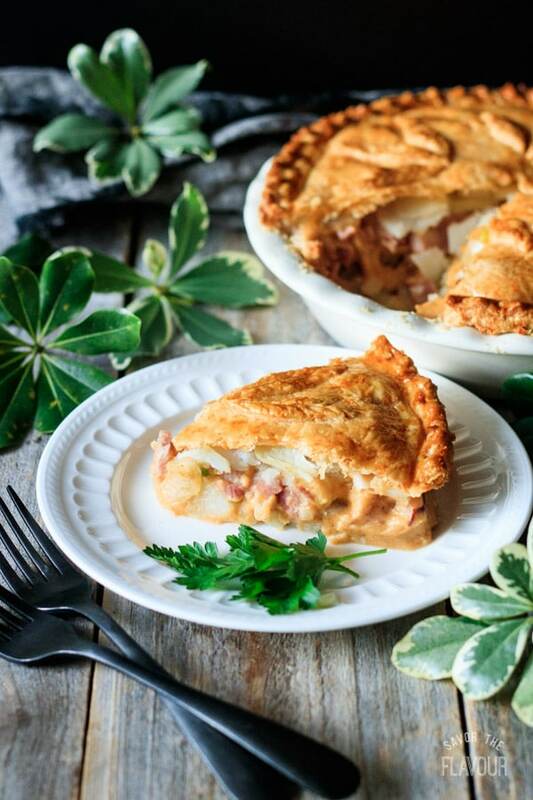 This cheesy ham and potato pie is a delicious way to use leftover ham from the holidays. 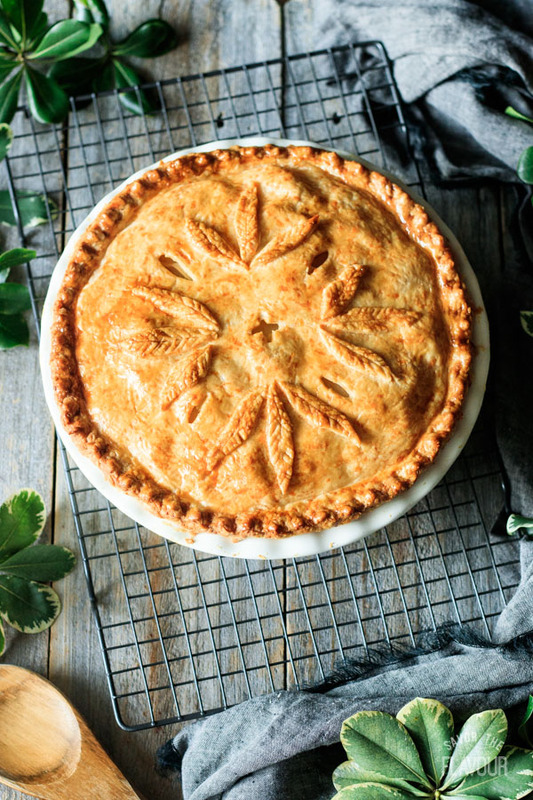 You can even make the pie days in advance, reheat, and serve–it still tastes wonderful. This cheesy ham and potato pie is comfort food meant to share! Can you freeze ham pie? 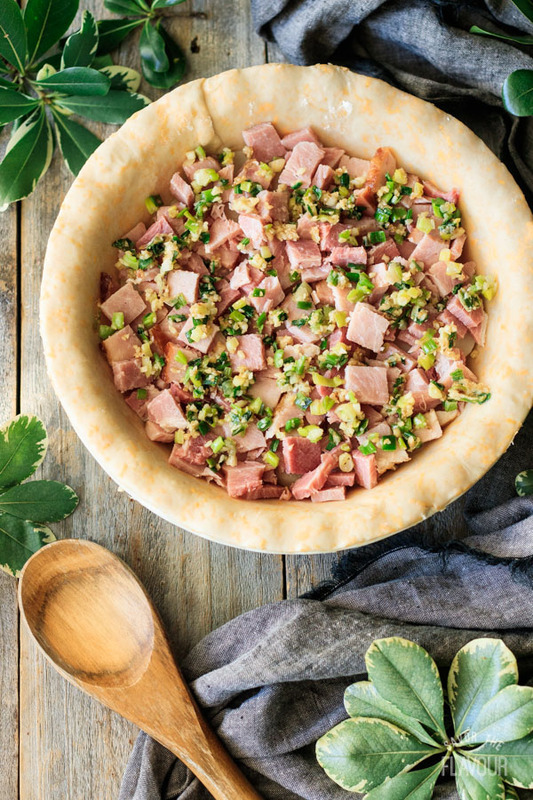 Yes, you can freeze ham pie. 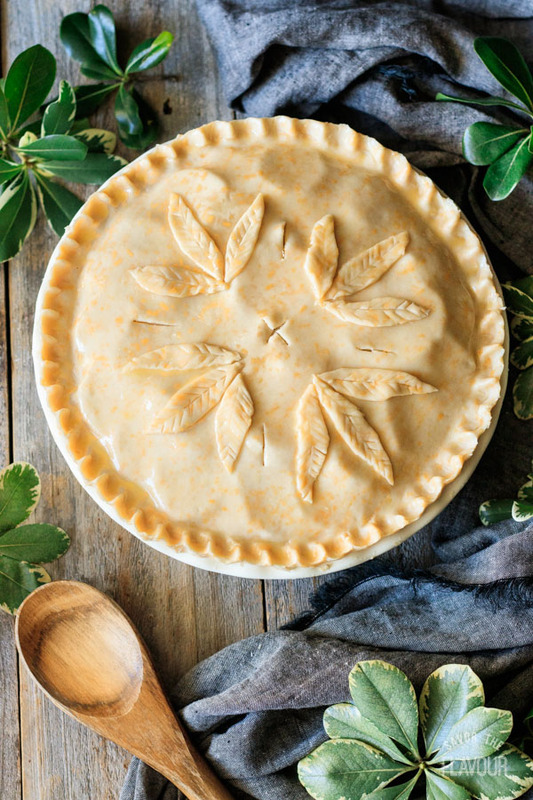 Chill the pie until cold, then slice and place in freezer bags or airtight containers and freeze for up to 1 month. Thaw in the fridge and reheat in the microwave or the oven. 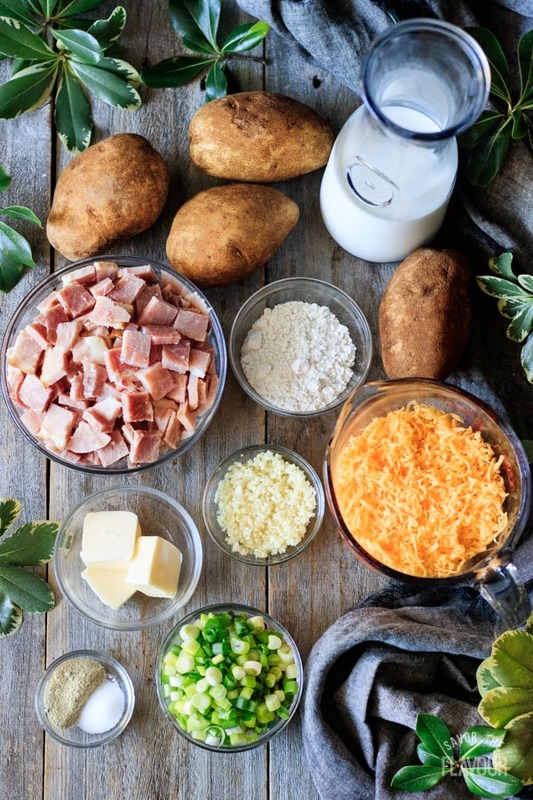 Gather the ingredients for the cheese pastry. Pour the flour into a bowl and add the butter, lard, and salt. 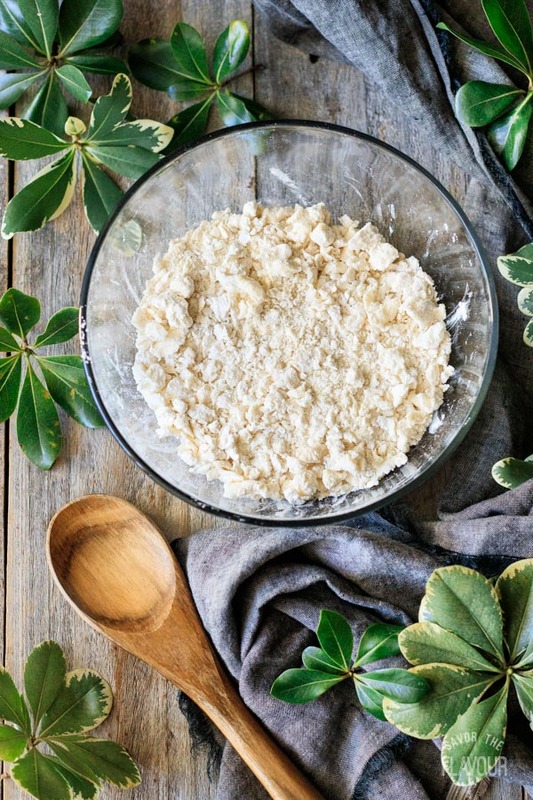 Pinch the fats and flour together until the mixture resembles breadcrumbs. 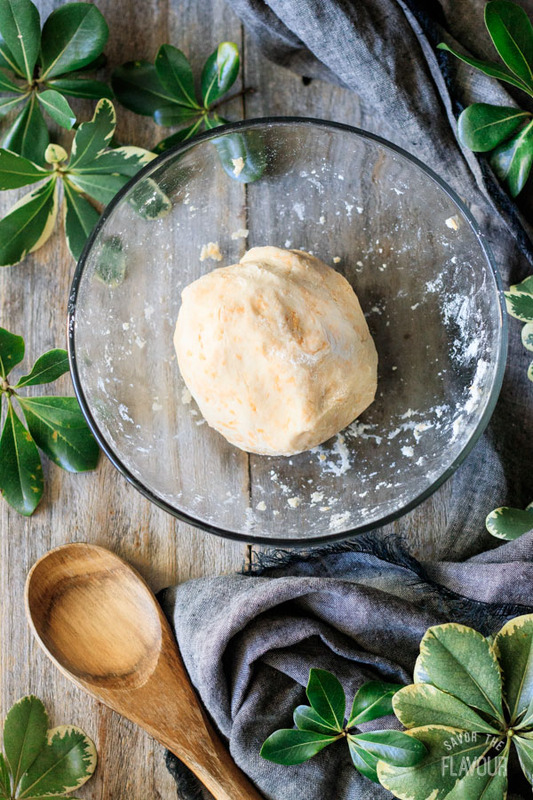 Gradually add 2-3 tablespoons of cold water and mix with your hand until a dough forms. Make sure all the flour is picked up from the bottom of the bowl. Knead the pastry a couple times until smooth. Shape into a disc, wrap in plastic wrap, and chill for 1 hour before using. Peel and thinly slice the potatoes. 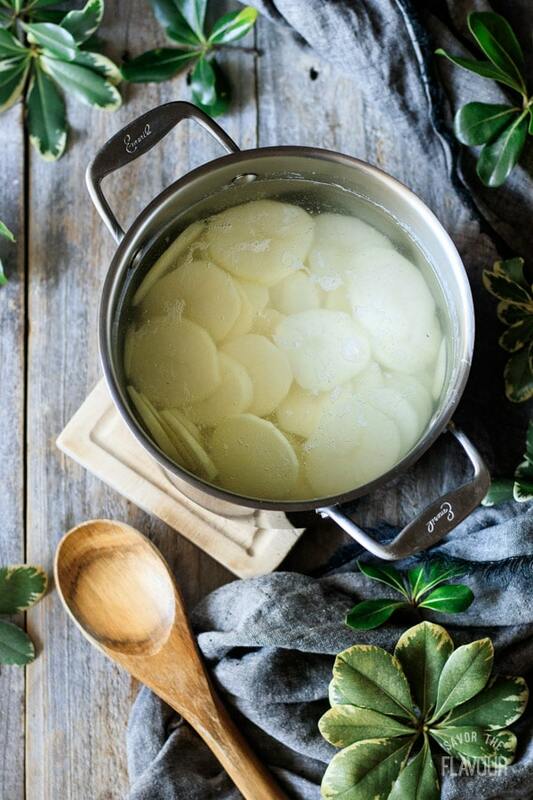 Place in a medium pot, cover with cold water, and boil until fork tender, about 3-5 minutes. Drain and set aside. Slice the scallion and mince the garlic. 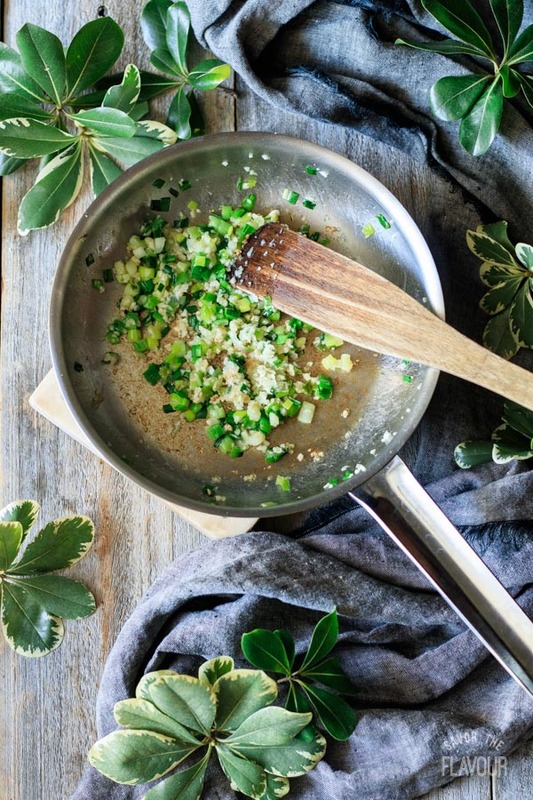 Melt a tablespoon of butter in a small frying pan until bubbly, then cook the scallions until soft. Add the garlic and cook for a minute more. Next, make the cheese sauce. 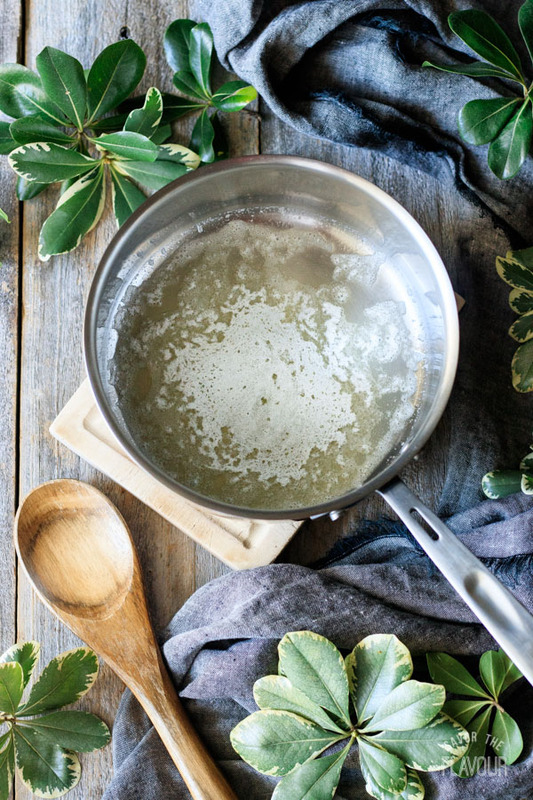 Melt the butter in a saucepan until bubbly. 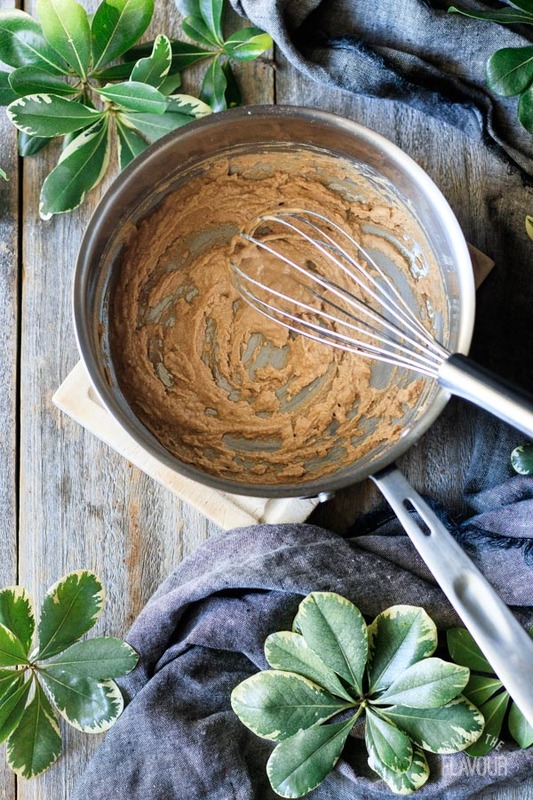 Add in the flour and whisk constantly until the roux has turned a light brown and smells toasty. 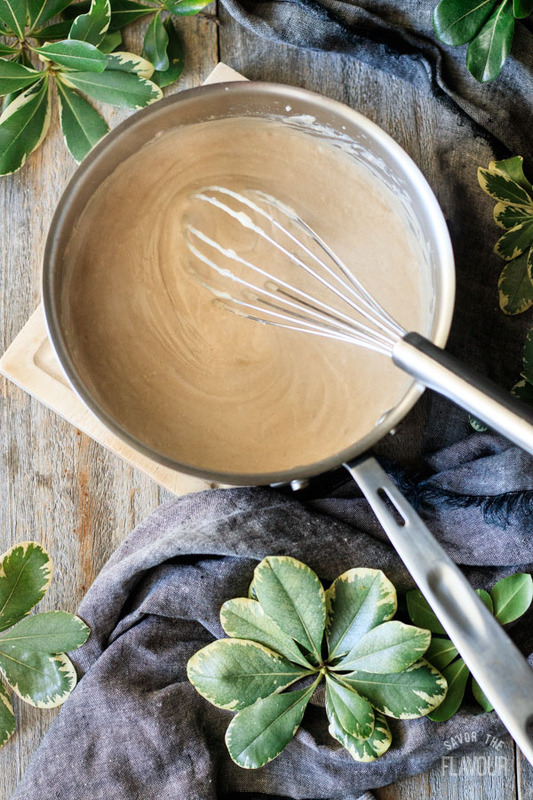 Whisk in a little of the milk, then add the rest and whisk until smooth. 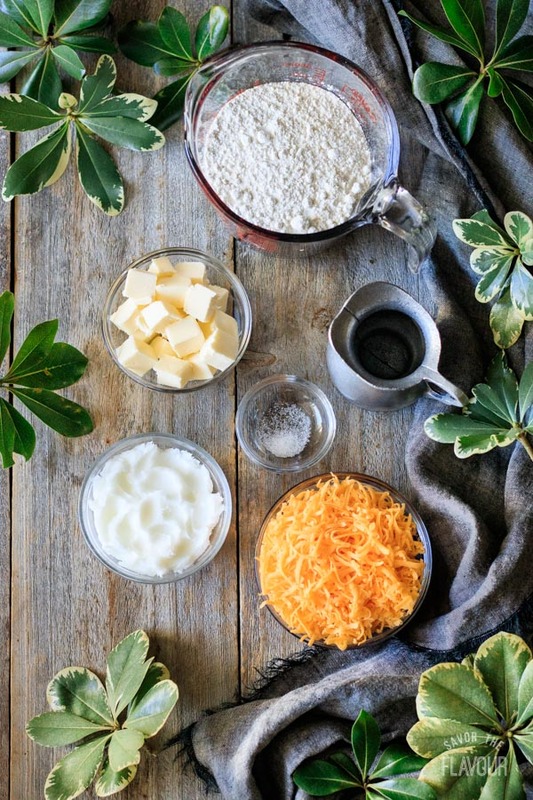 Whisk in the cheese and spices until well combined. Keep the sauce on low heat until needed, stirring occasionally. Line a 9-inch, deep dish pie plate with some of the cheese pastry. 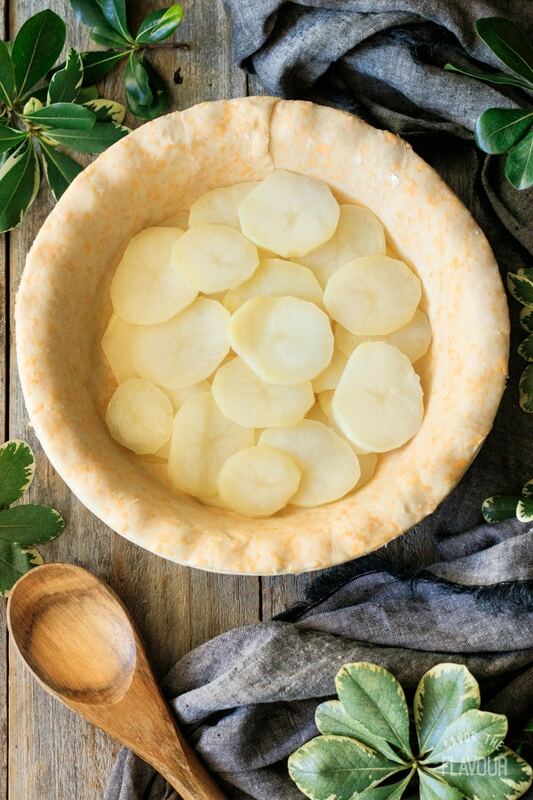 Layer half of the cooked potatoes in the pie plate. Top with half of the ham and all of the scallion/garlic mixture. Spread the cheese sauce on top. Brush the edge of the pastry, then top with the remaining pastry and press down the edges to seal. Crimp the edges as desired, then brush the whole pie with beaten egg. Decorate with scraps of pastry and cut a few vent holes. Bake the pie at 400 F for 35-40 minutes, until golden brown. Let it cool for at least 15 minutes before slicing and serving. Chill the pastry while you prepare the filling. Cold pastry is easier to work with and is more flaky. Measure out the cheese sauce ingredients before you make it. 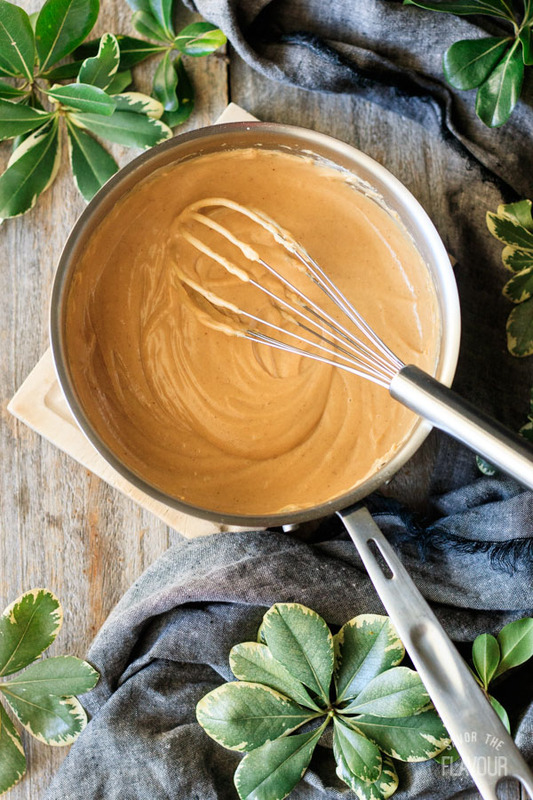 The roux can burn if you stop stirring to measure ingredients. 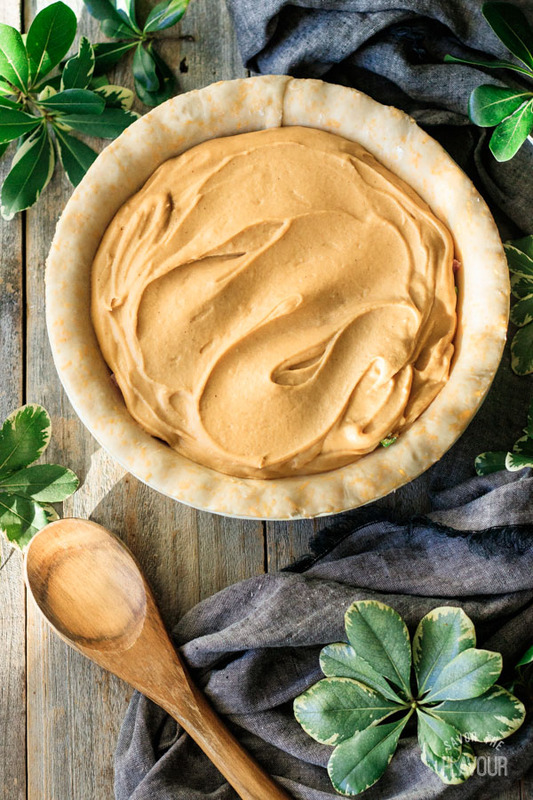 Gently press down the layers to help them fit into the pie plate. Bake the pie on top of a preheated cookie sheet to help the bottom pastry cook properly. Make the pie up to a week before. Store covered in the fridge until needed. 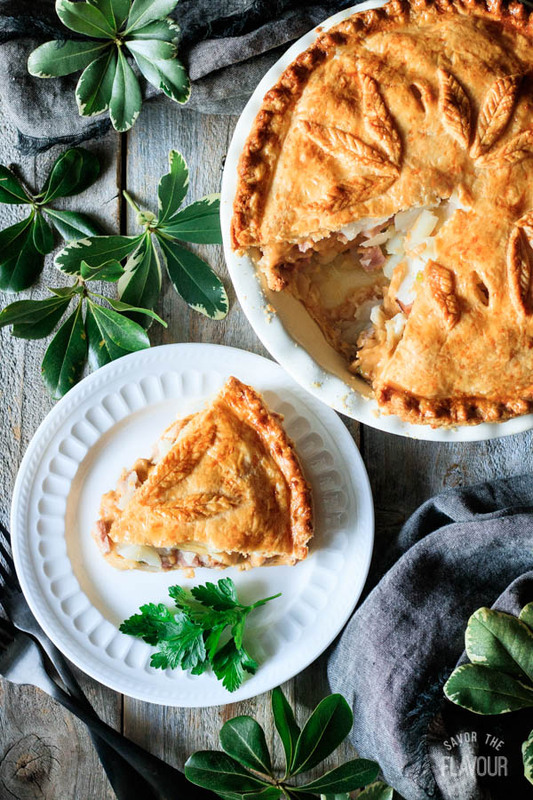 Hungry bellies will love these other tasty savory pies. 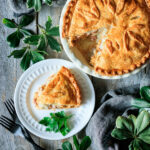 Ham and Cabbage Pie: a creamy Irish-style pie topped with flaky homemade pastry. 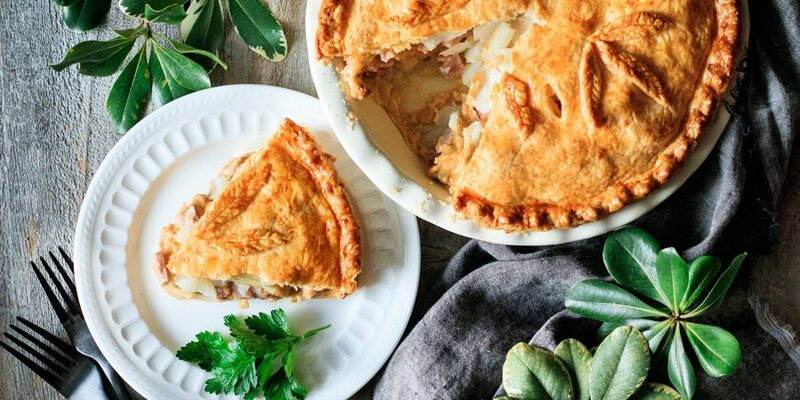 Irish Dingle Pie: this delightful pie uses leftover roasted lamb and lots of veggies. 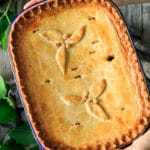 Old Fashioned Corned Beef Pie: WWII-style corned beef baked with veggies and crisp pastry. Did you make this cheesy ham and potato pie? Please leave a star rating below the recipe to share how you enjoyed it. This recipe is delicious. 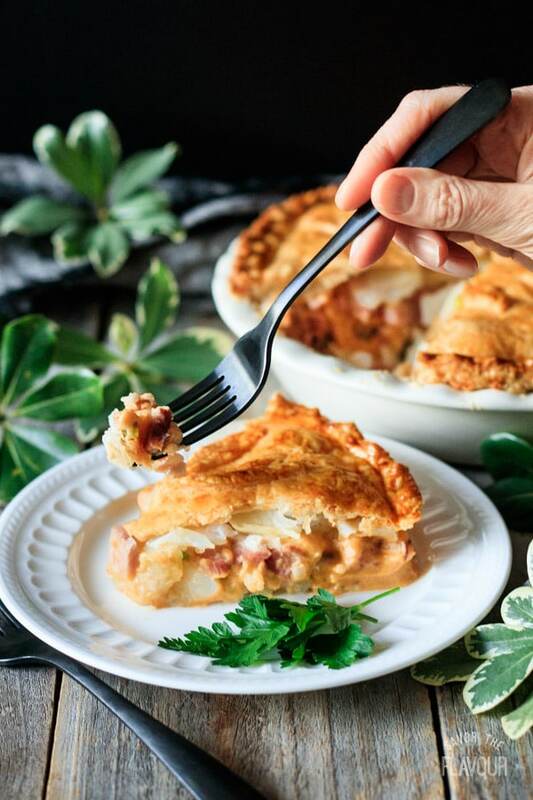 A great way to utilize leftover ham, but in my case – – since I live alone and only cook a ham when I have company, I used a ham steak. I did take a shortcut (by using a refrigerated crust), but enjoyed it so much, I will try it again and make the cheese pastry. Great job, ladies! 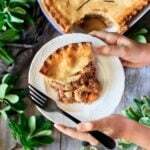 Next savory pie I would like to try is Tourtiere. Sounds yummy! Thank you so much! I hope you enjoy the cheese pastry and the tourtiere!